Want a simple, weeknight meal you can make for under $10? Don’t settle for a boring pot roast with little flavor. With a few simple ingredients, you can take a beef roast from boring to incredible! 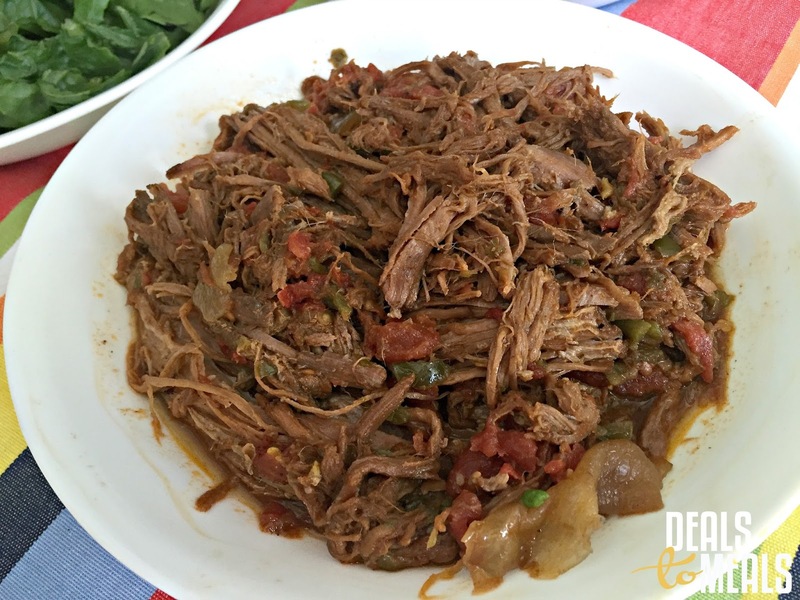 I love using this shredded beef for simple tacos, burritos or I use it in my enchiladas. This meat is so tender and amazing that I could really just eat it by the plateful. This meat does call for one of my favorite Mexican seasonings that you might not have–but you’ll want it. It’s the McCormick Mojito Lime Seasoning. You can buy it at a grocery store in a small packet for $2-$3, but I buy it online in a 26 oz. size because it is so delicious on all of my favorite Mexican dishes. The best part about this recipe is nearly all of the ingredients are on sale at your local grocery stores. Beef roasts are on sale for great prices, which make this meal super inexpensive and a great solution to your weeknight menu plan. Plus, if you cook up a large roast you can use the extras for later meals or freeze for another night. Enjoy! In a slow cooker, place the boneless beef roast. Dice the onion and place over the beef roast. Season the top of the roast and onions with the steak seasoning. Put the crock pot lid on the roast and turn on med-high heat. Cook the roast for 5-6 hours, or until the roast shreds easily. Once the roast is ready to shred, remove some of the excess fat and discard. If there is too much juice, drain some of the juice from the roast (don't discard, but keep in case you need to add it back to the meat). To the meat, add the diced green chilies, diced tomatoes, salt, cumin, Mojito lime seasoning and chili powder. Shred the meat and season as desired or needed.